Get business growing with this flower themed kit. 2.08oz chocolate in clear cello bag. 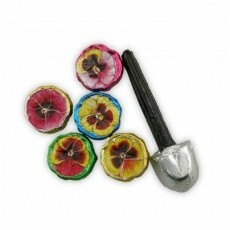 Filled with 5 milk chocolate foil wrapped pansies in assorted colors and 1 chocolate foil wrapped shovel. Pansies available in milk chocolate only. Tied with ribbon.